This year the Liverpool Cruise Terminal has welcomed more than 100,000 international passengers and crew and approximately 50,000 spectators to the waterfront during cruise ship visits, generating an economic impact of around £7 million. During 2018 Liverpool has welcomed 57 cruise vessels, which amounts to approximately 3million GT (gross tonnage) of shipping traffic to the River Mersey. The team at Cruise Liverpool has also operated 24 turnaround calls and 33 transit calls throughout the season. In addition to cruise ships, Liverpool Cruise Terminal provides specialist support to a range of working vessels, such as dredgers and offshore wind farm support vessels. In addition to these specialised functional vessels, the cruise terminal has also welcomed calls from both royal and foreign Navy. During the 2018 cruise call schedule, Liverpool Cruise Terminal received 4 inaugural calls, including the first ever call by a Japanese vessel, Ocean Dream – who will be returning to Liverpool in 2019 for an overnight visit. In May the city welcomed the 3 Tall Ships as part of the Tall Ships Festival, the berth was open to the public over the bank holiday weekend. Almost 10,000 visitors were recorded. Only a few months ago, Disney Magic returned to Liverpool. September saw the return of the ‘Magic on The Mersey’ event, which included spectacular street theatre, a Disney character parade and a farewell pyrotechnic display attracting 30,000 visitors and bringing in approximately £250,000 to the city’s economy. Such was the popularity and success of ‘Magic on the Mersey’ it won the 2018 Tourism Event of the Year at the Liverpool City Region Tourism Awards, thanks in no small part to the wonderful team at Cruise Liverpool. There are more than just memories being made, the proposed new cruise liner terminal is gearing up for site preparation works for the new facilities with work expected to start in the New Year. Equivalent to the size of two football pitches, the terminal will be serviced by an off-site multi-storey car park and will enable the world’s largest cruise ships (up to 3,600 passengers) to embark and disembark at Liverpool. It’s also expected to directly create more than 500 new jobs. Deputy Mayor of Liverpool and Cabinet member for Culture, Tourism and Events Cllr Wendy Simon, said; “2018 has been an extraordinary year for Cruise Liverpool. 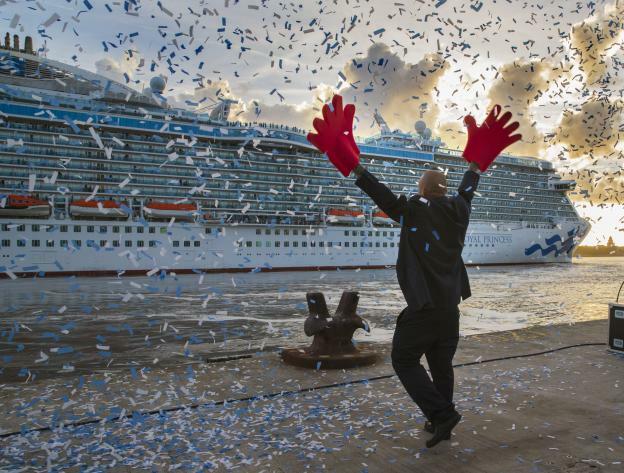 Winning tourism awards and having staff internationally recognised as dynamic leaders in the global cruise industry, as well as bringing 57 cruise ships to the city and generating an economic impact of around £7million. This entry was posted in Cruises, Latest News, Liverpool on November 29, 2018 .